Create a high-frequency, enhanced bus transit corridor from downtown to the new Florence Transit Hub with specialized branding and operational treatments applied to vehicles and service corridors. Improve stop design and amenities (new shelter, signage, bike racks and route information) at major intersections where transit activity is high, right of way is available, and there is public support. Potential enhanced bus stops are proposed for Pike/Scott, Pike/Holman, St. Joseph Lane, the Fort Mitchell Kroger, KY 236 (Commonwealth)/Stevenson, KY 1017 (Turfway)/Lloyd, and the Florence Walmart. Where on-street parking is permitted at all times, construct bus bulbs by expanding the bus stop area into the parking lane or eliminate on-street parking for northbound from 7:00a.m. to 9:00a.m. and southbound from 4:00p.m. to 6:00p.m. at three potential locations (Pike Street at Russell Street, Pike and Eighth streets at Russell Street, and Montague Road). Final locations will be determined through a specific site design and planning process. Identify intersections where traffic cycle times create long lines and install bus traffic signal priority. Cities and the Kentucky Transportation Cabinet (KYTC) should continue to implement access management improvements recommended in the June 2006 Dixie Fix Plan at every opportunity to reduce driveways and increase safety and travel time on US 25 between Downtown Covington and KY 1017. The City of Florence is encouraged to consider implementing Dixie Fix Plan access management improvements along US 25 and US 42 from KY 1017 to Mall Road to encompass the entire transit corridor. Coordinate TANK schedules to increase the reliability and on-time performance. In the long range, increase service frequency to 15 minutes during peak-time and 30 minutes during off-peak. Paint sharrows along right lanes every eight feet or immediately following an intersection to enhance bicycle safety. Cost estimate includes entire corridor. Approximately, Kenton County section is 75% and Boone County 25% of the below values. Separate tables are shown for each county. US 25 offers mixed-use, dense, urban environment, supporting high demand for transit ridership with higher than average concentrations of low income, disabled, elderly, zero car households, and other populations that depend greatly upon public transit for daily travel needs. 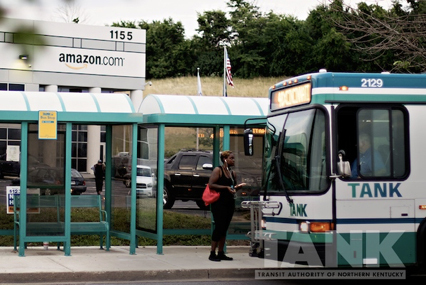 By coordinating route schedules, reducing bus stops, and increasing bus frequency and priority, waiting times will be cut in half making transit more competitive with driving and more attractive. Bus bulbs ensure that cars do not block bus stops, provide a dedicated waiting area for transit users, clear sidewalk area for pedestrians, and improve travel time and on-time performance. Transit stations improvements at key, high volume intersections provide public/private economic development opportunities. The I-71/75 corridor is often congested. When this occurs, the US 25/42 corridor serves as a critical alternate route option especially for AM and PM peak Boone County commuters. Additional distances between bus stops may create problems for elderly and disabled persons. Bus bulbs may block and create slight delays for motorists while transit passengers load/unload. The removal of on-street parking during peak times will create an inconvenience for residents. Right of way is not available for bike lanes or other improvements. Traffic signal prioritization is a new concept that will require public education and time. Except for Park Hills, data shows that US 25 is suffering from some of the most extensive peak period congestion for Northern Kentucky roadways. All but two US 25 segments have Critical Crash Rates that exceed state safety average for similar type roadways. Between 2012 and 2016, the segments of US 25 and US 42 in Boone County experienced a total of four crashes involving bicyclists, 20 pedestrians and one fatality. During the two year period of 2010 to 2012, the US 25 Erlanger and Elsmere section between KY 236 and the Boone County Line had the highest number of crashes with a total of eight crashes involving bicyclists, three pedestrians, and another six were motorist-only. Employment density ranges from 1,000 to more than 5,000 employees per square mile along the corridor. Looking out to 2040, overall employment growth along this well-developed corridor is projected to be low in comparison to other areas in Boone County. However, with Florence Mall, Crestview Hills Town Centre and Downtown Covington providing the anchors, commercial redevelopment continues Downtown and additional commercial/retail and residential development is slated in several pockets along the corridor some of which being more substantial, 15-40 acres, in scale. Some of the Kenton County’s most densely populated areas border US 25 creating a strong need for on-street parking. Elderly, disabled, and zero car households range in density from 20 percent to 40 percent. Like employment, population growth amongst properties along the entire corridor is projected to increase modestly by 2040. Sidewalks exist on both sides of US 25 and US 42 through much of the corridor. However, there are a few sections where a single sidewalk exists. The only segment with no sidewalks is located between Park Hills and Covington. Signalized crosswalks exist at almost every intersection. US 25 carries TANK’s most heavily used fixed bus route (1) averaging approximately 20 boarding passengers per service hour. The route runs between downtown Cincinnati, Covington, and Florence Mall seven days a week, with 30-minute frequency at peak and 45 to 60 minutes frequency during off-peak. Buses often experience delays due to heavy traffic.